Google has begun rolling out a new Personal tab on its search results page, so users can quickly switch to looking through their own stuff rather than the web at large: items from Gmail, Google Photos and other Google services are included. The search capabilities aren't actually new - you've long been able to search through your private Google Photos and Gmail accounts from the Google search page, as long as you're logged in - but the new tab puts a clearer line between what's personal and what isn't. 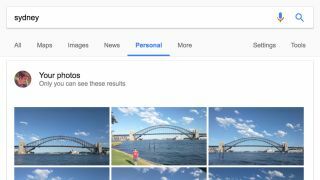 For example, you could put "sydney" into Google and see the usual mix of results from Wikipedia and the Australian tourist board, then switch to the Personal tab to get photos you've taken in the city, or emails that mention it, or appointments mentioning Sydney from your Google Calendar. There's been no official announcement from Google yet but it seems the roll out has been relatively widespread, making us think this is more than a limited trial. Check under the More menu after searching on a phone or computer to see if you've got the feature. As yet the Personal filter option doesn't seem to have made it to the official Google apps for Android and iOS, though it should do in due course. Obviously, none of your personal stuff can be seen by anyone else - you need to be logged in to view it. The move might mean more users looking for their own stuff through Google, and allowing Google to serve up ads against it. The Personal tab also reinforces the way Google has evolved as a company, from indexing the web at large to trying to know as much as it possibly can about you.